It was January, and it was time for the test run of the new course I had just written on cloud computing security. Oh no, I would have to leave Indiana in January and go to Los Angeles! Well, maybe that isn't a bad thing after all. 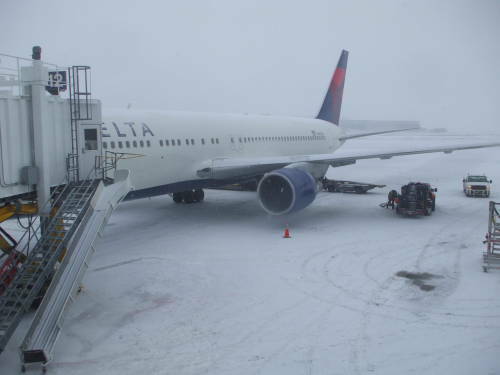 Indiana: Temperatures around 10°F or -12°C, high winds, snow, ice. 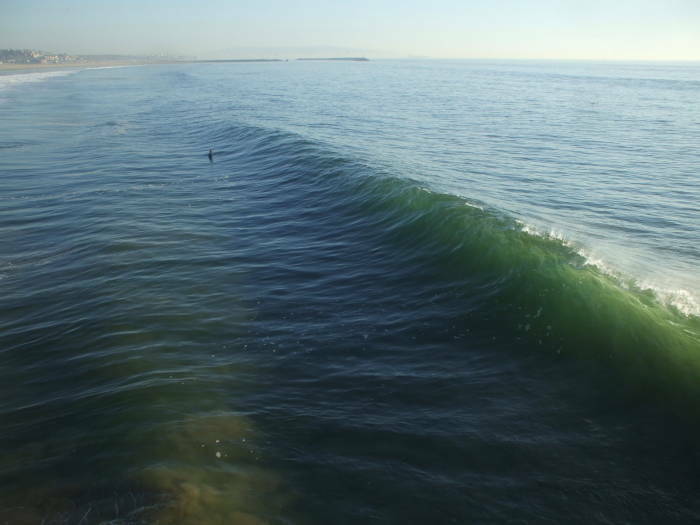 California: Temperatures around 70°F or 20°C and sunny. Yes, that is a very nice change of scene! ...and arriving in Southern California. 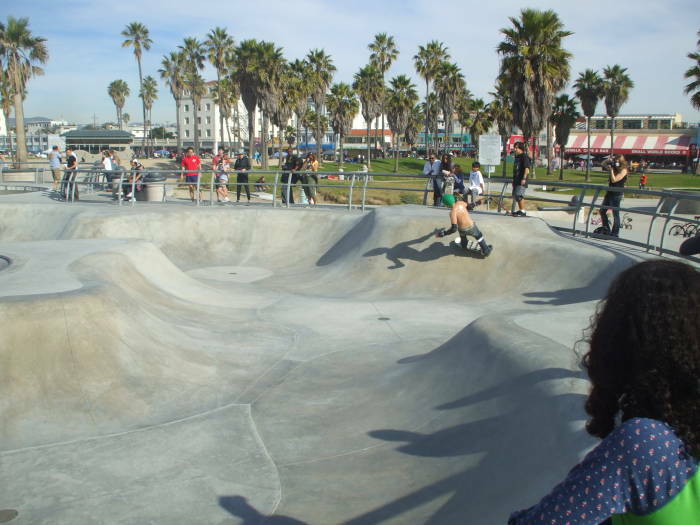 Then I went to Venice Beach to relax for a few days. 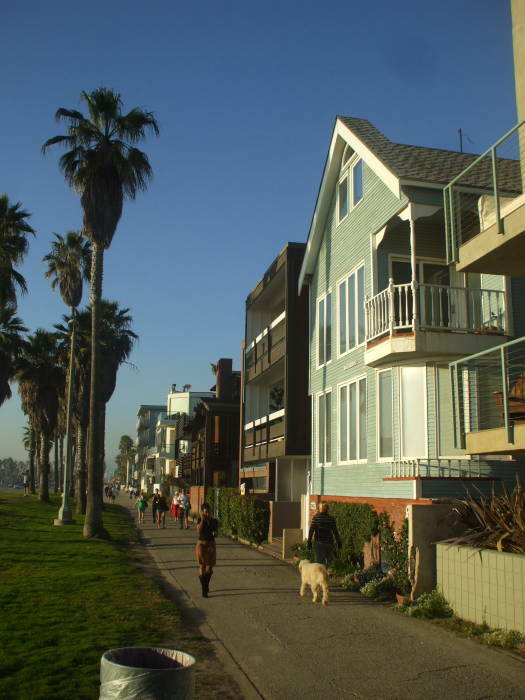 Venice is a community along the Pacific Ocean beach, between Marina del Rey to its south and Santa Monica to its north. 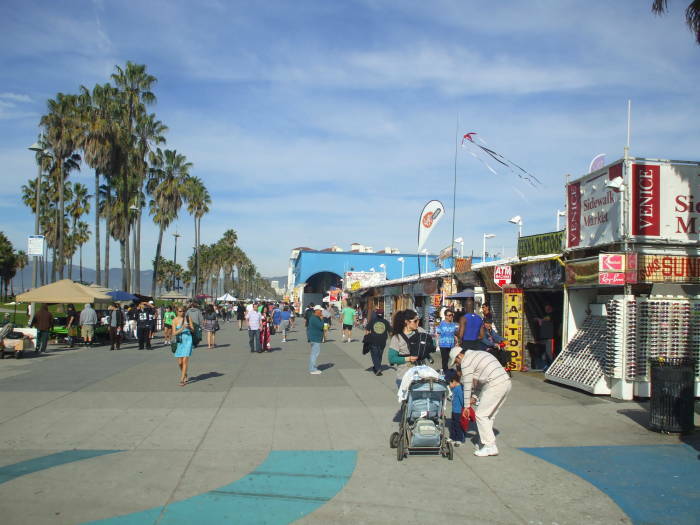 The main feature there is Ocean Front Walk, a 4 km pedestrian-only promenade that is one of Los Angeles' primary tourist attractions. 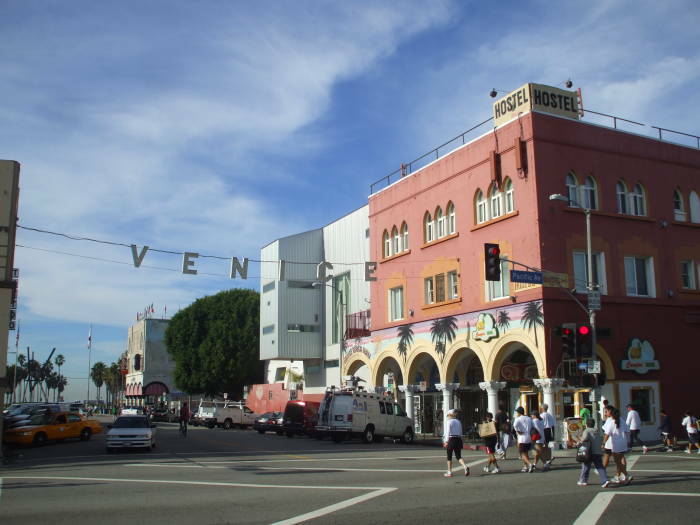 Venice was founded in 1905 as a beach resort town by the tobacco millionaire Abbot Kinney. He called it "Venice of America". Kinney excavated several kilometers of canals to drain the swampy area inland, destined to be a residential area. The canals were connected to the name, as it was meant to evoke Venice, Italy. Well, if Venice, Italy was populated by musicians, snake charmers, and sword swallowers, and filled with T-shirt shops and tattoo parlors, it would be evoked by today's Venice. 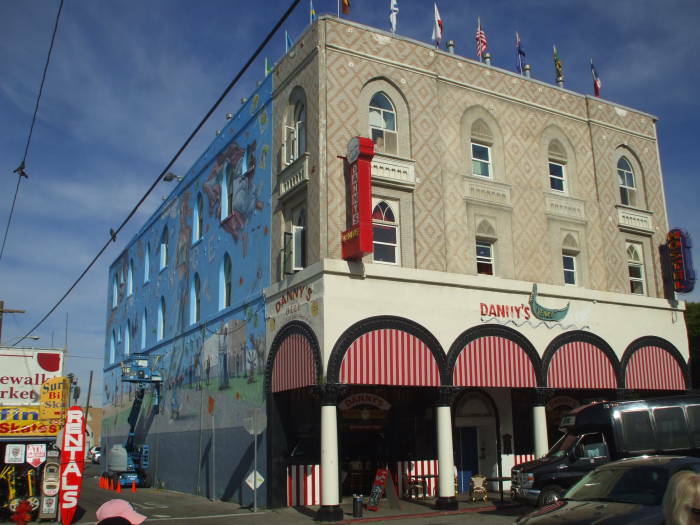 Kinney constructed an enormous complex of tourist attractions: an auditorium, a large restaurant designed to look like a beached ship, hot salt-water baths, and more. 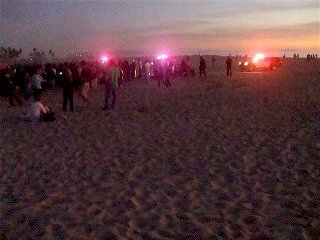 But the biggest attraction, just as it is today, was the broad beach. The attractions became more of an amusement park through the 1910s. But with the arrival of Prohibition, the destruction of the amusement pier by fire, and Kinney's death in 1920, Venice's revenues were hurt. The family quickly rebuilt an amusement pier. The nightlife was active through the 1920s and 1930s, and thousands of people would arrive every evening by streetcar from Los Angeles. Benny Goodman was a bandleader in Venice. Political battles with the city of Los Angeles ensued. Many of the canals were filled in and paved over after the city annexed Venice. Then, in 1929, oil was discovered at the south end of the Venice Peninsula, now the north side of the harbor leading into Marina del Rey. 450 oil wells were constructed within two years, operating into the 1970s but clogging the remaining canals with drilling waste. The area was neglected after annexation by the city. The primary north-south road through Venice, Pacific Boulevard, wasn't even paved until 1954. By then Venice had become known as the Slum by the Sea, and mainly housed recent European immigrants in low-rent bungalows. The Beat Generation and other counterculture types began to congregate in Venice. 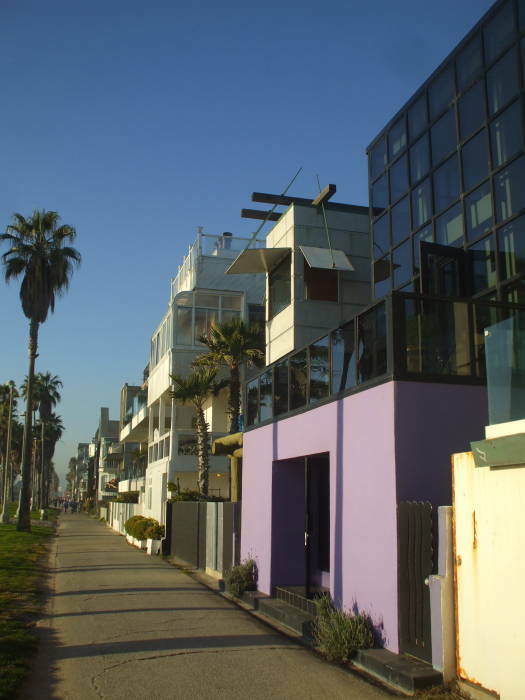 Jim Morrison and The Doors got their start in Venice. 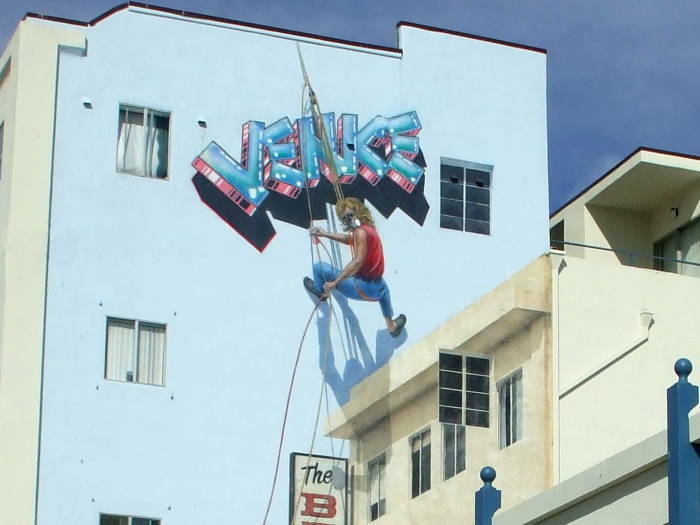 Through the 1960s Venice was a counterpart to the Haight-Ashbury area of San Francisco. 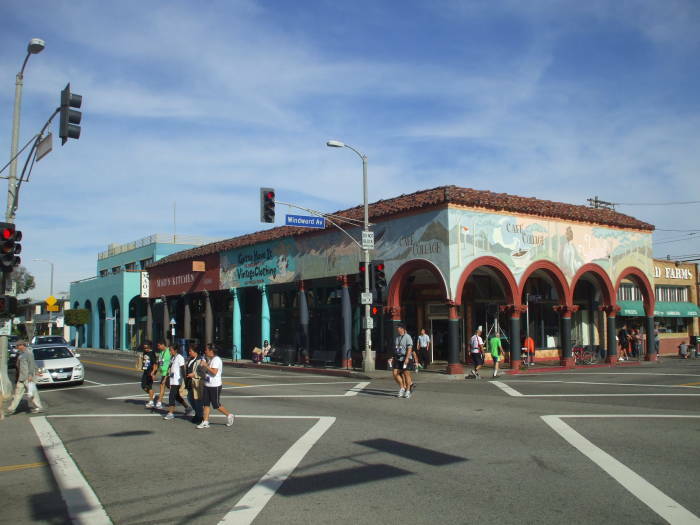 Now, with a median household income in the high $60,000s, it is one of the wealthiest neighborhoods in the city of Los Angeles. 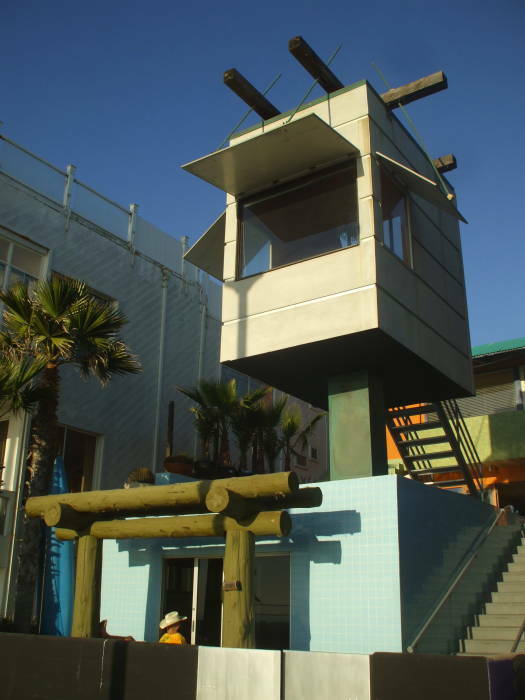 Lifeguard station on the beach at Venice, California. Here is one of the lifeguard stations and their yellow truck, on a wide beach with palm trees along the colorful boardwalk. Yes, this is Venice. 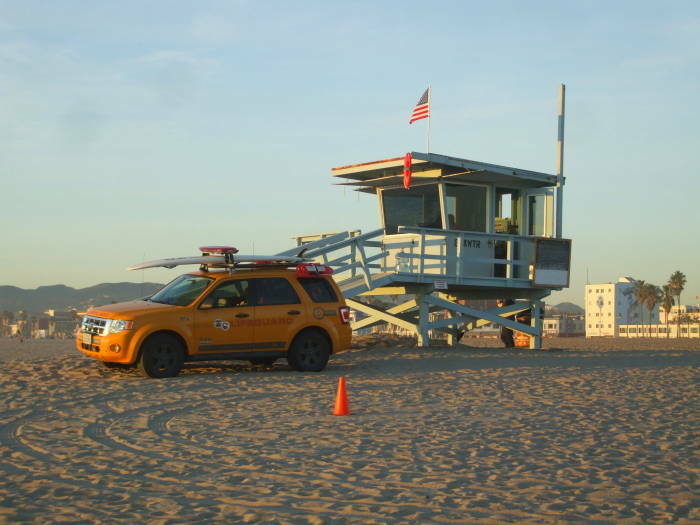 Venice Beach is the headquarters of the Lifeguard Division of the Los Angeles County Fire Department. This is the nation's largest ocean lifeguard organization with over 200 full-time and 700 part-time lifeguards. 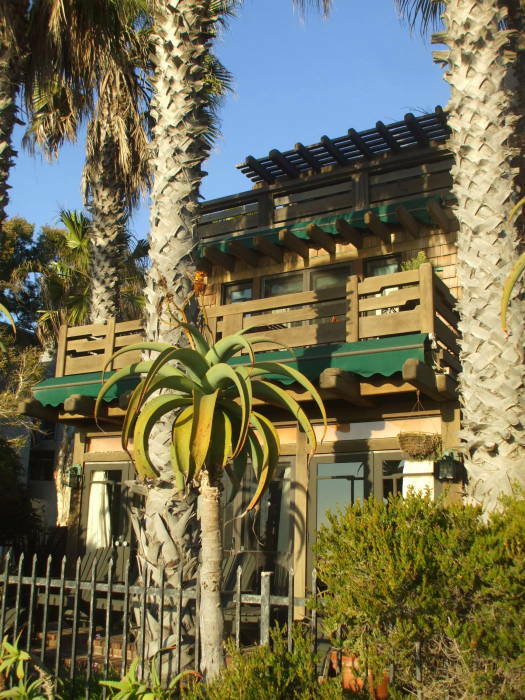 They watch over 50 km of beach and 110 km of coastline, from Malibu south to San Pedro. They also provide maritime fire-fighting, maritime rescue, cliff rescue, and paramedic and rescue boat service for Catalina Island. 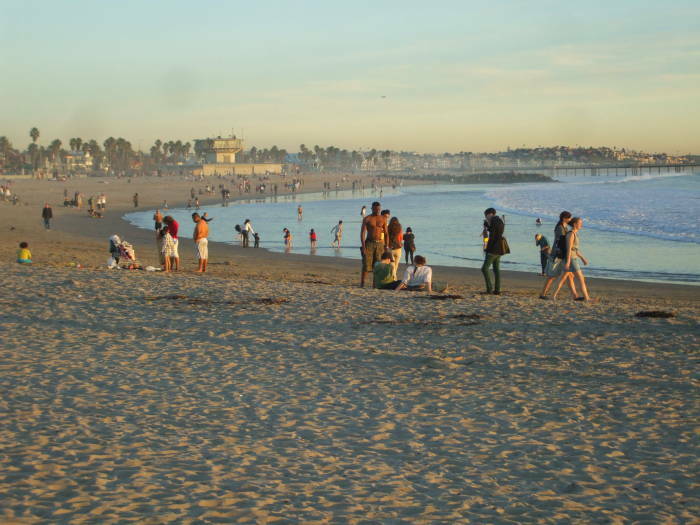 People enjoying the beach in the late afternoon. 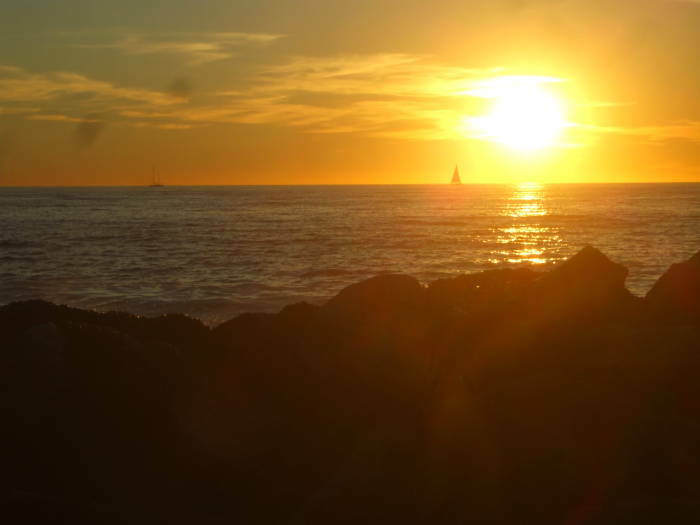 A sailboat passes the setting sun. 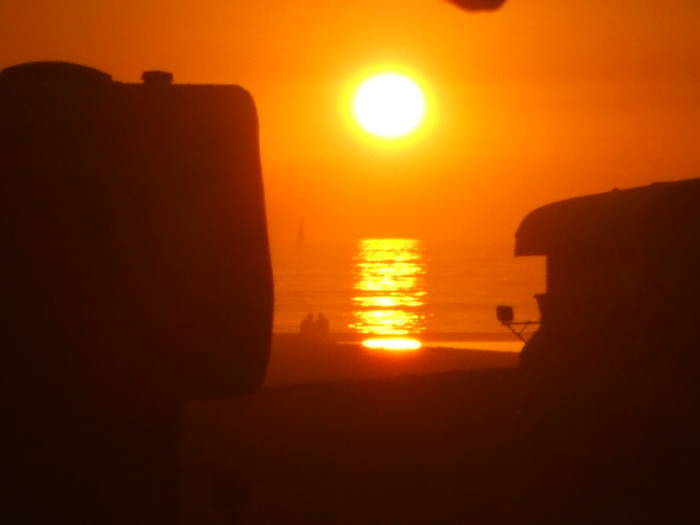 The Venice Breakwater provides a nice view of the sunset. 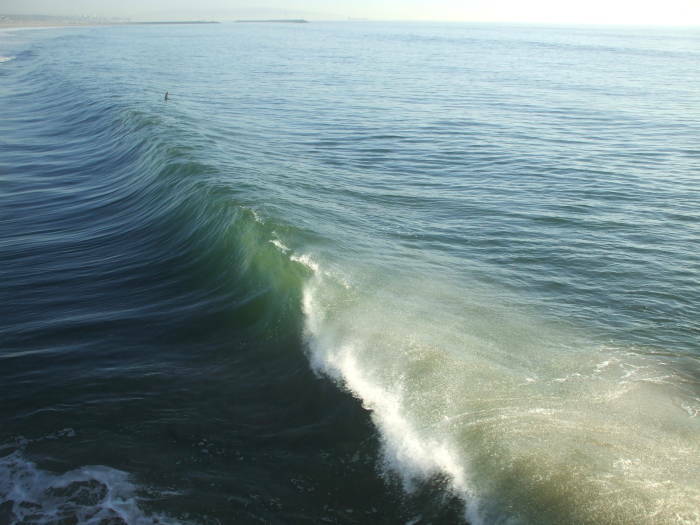 This is a prominent surfing area, with its breaks varying with swell intensity and direction and the tide. 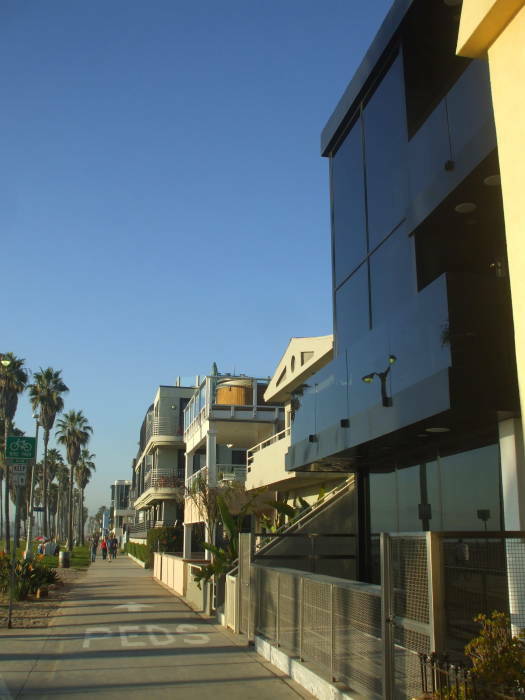 This is the intersection of Windward and Pacific Avenues, the street address that would get you to the heart of Venice Beach. 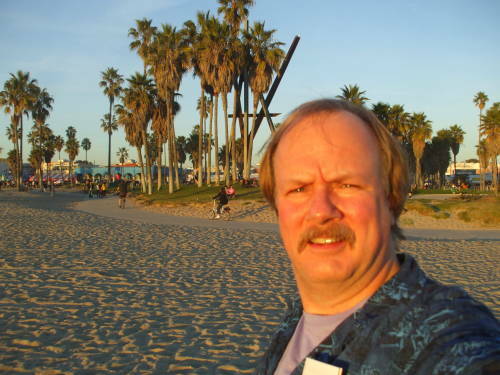 The beach is just down Windward, past those palm trees and that large K-shaped sculpture visible in the distance. Many of the buildings with their arched fronts extending over the sidewalks date back to Kinney's time. There's a hostel in the building on the northwest corner of this intersection, and an even better place to stay one block closer to the beach on Windward. The Collage Cafe is a good place to get breakfast when you're staying in the area. It's a local coffee shop with a variety of breakfasts and sandwiches, open all day. It's right on the corner, underneath the red arches. Mao's Kitchen, next door along Pacific, is a good place for lunch or dinner. It's to the left in this picture, with the dark red overhead and columns, between the two places with light blue-green columns and arches. Windward and Pacific Avenues, looking down Windward to the beach. Windward and Pacific Avenues, looking north on Pacific. Collage Cafe and Mao's Kitchen at Windward and Pacific Avenues. 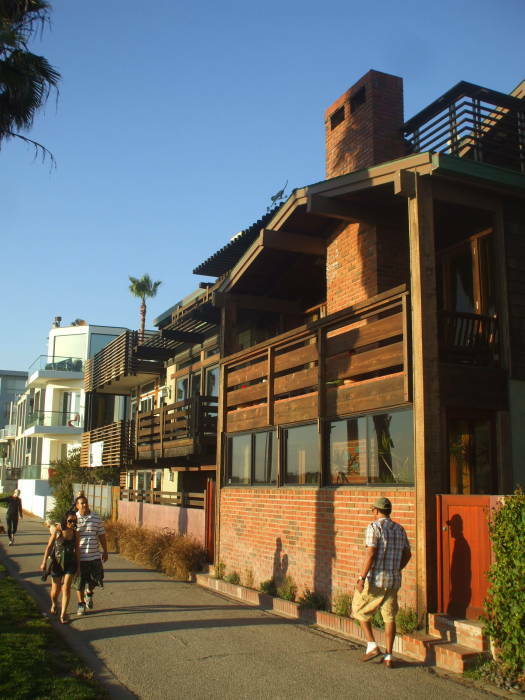 I have stayed a number of times at what used to be called the Venice Beach Cotel at 25 Windward Avenue. Now they're SameSun, +1-877-972-6378. To get there from LAX, take the airport shuttle bus to Lot C and its bus terminal. 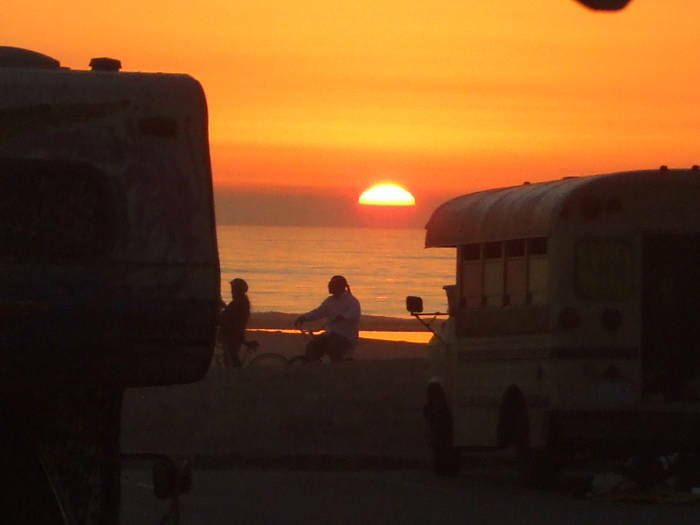 Then take the Santa Monica Big Blue Bus #3. Buy an MTA transfer with your ticket. 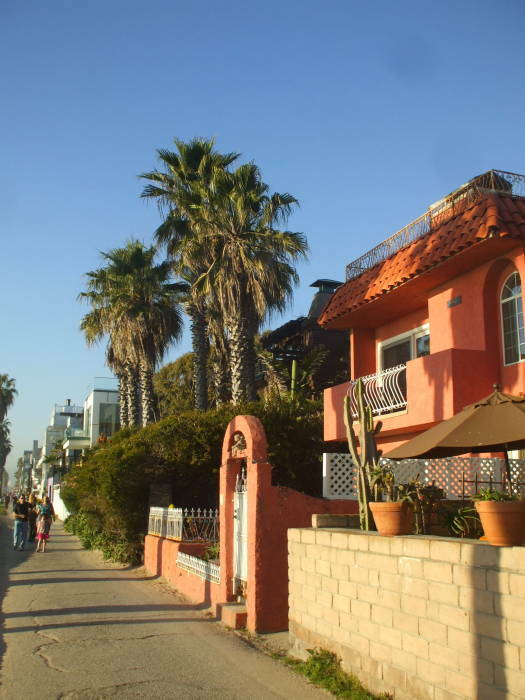 Take BBB #3 to where Lincoln Avenue intersects Venice Boulevard. Then take city bus #33 or #733 west on Venice to the traffic circle near the intersection of Windward and Pacific Avenues. The hostel is just a block toward the beach from that intersection. 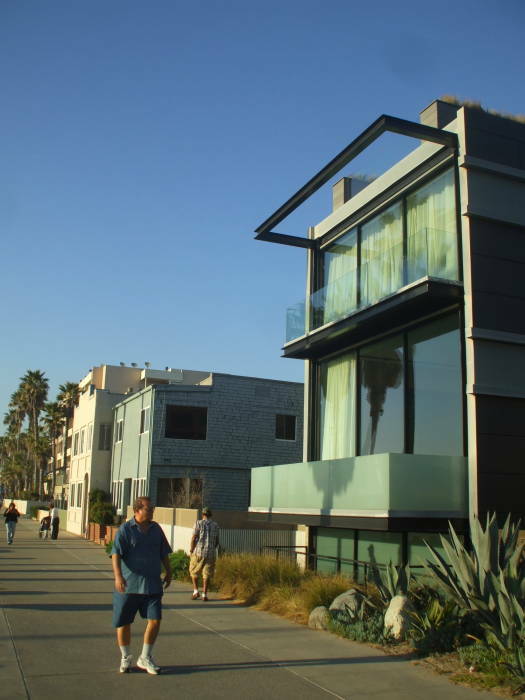 Venice Beach Samesun hostel on Windward Avenue. 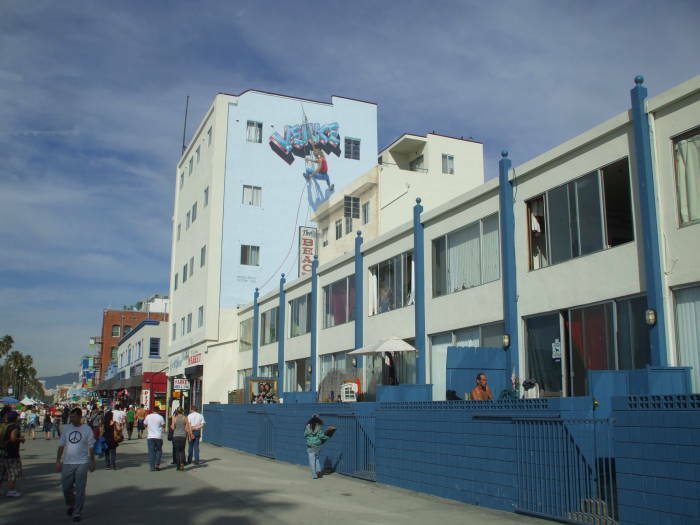 Venice Beach Samesun hostel and its famous mural. The hostel has a mix of private and shared rooms, some with private bath and some without. The mural on the side of the building is an update to Botticelli's The Birth of Venus. Venus Rising From The Sea On Rollerskates. 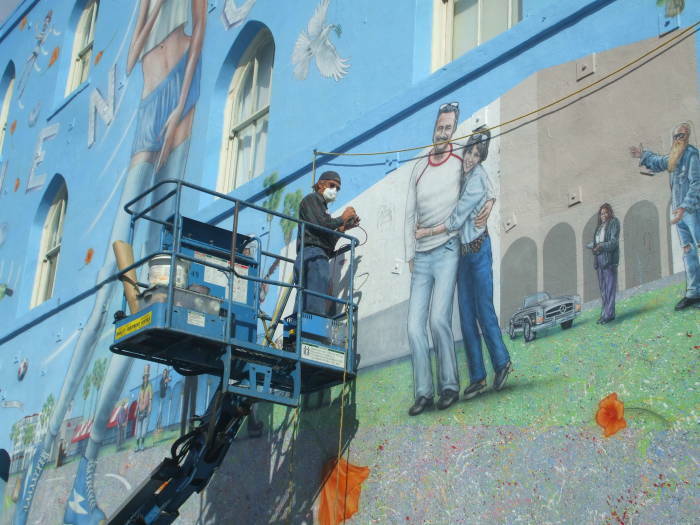 An artist adds to the mural. 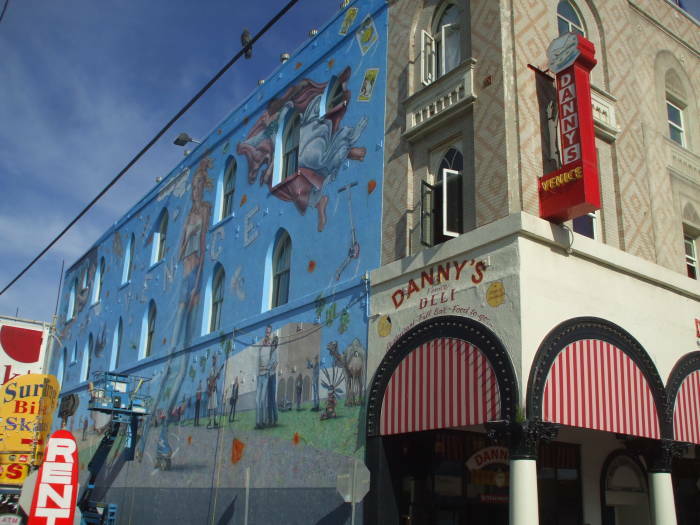 The distinctive mural has led to the building's appearance in several movies and TV shows. 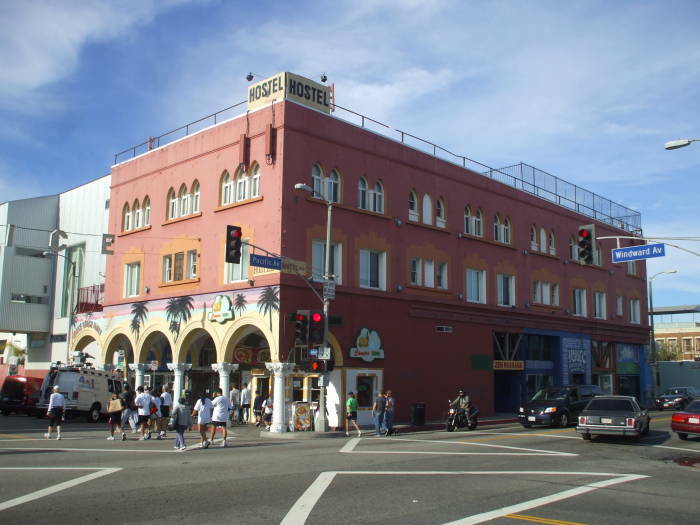 For example, Sarah Jessica Parker's character in L.A. Story lived in this building. 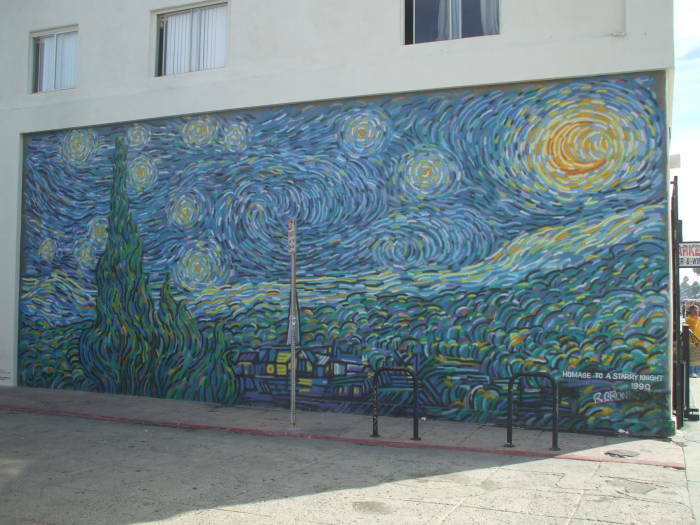 A false entrance was put up on the side of the building, as if the entrance was on the side alley along the bottom of the mural. There's no door here, and you'll notice in the movie that you never really see her come out or go in through that door, you just see at the top of the steps. The mural gets touchups and additions from time to time. 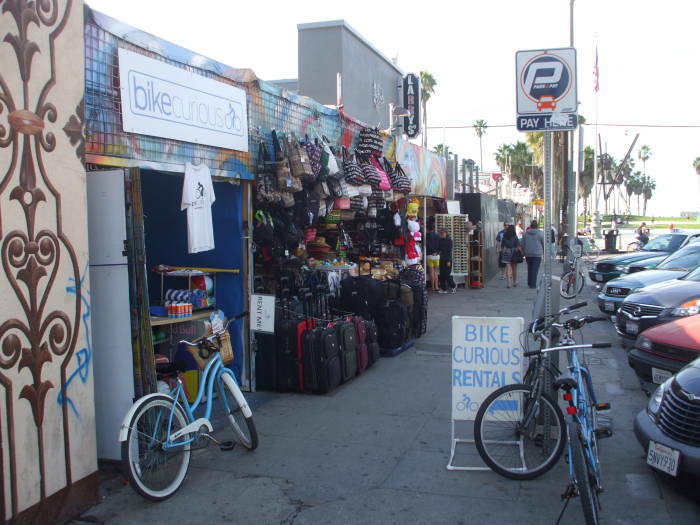 There are plenty of places to rent or buy surfboards, skateboards, bicycles, and so on. 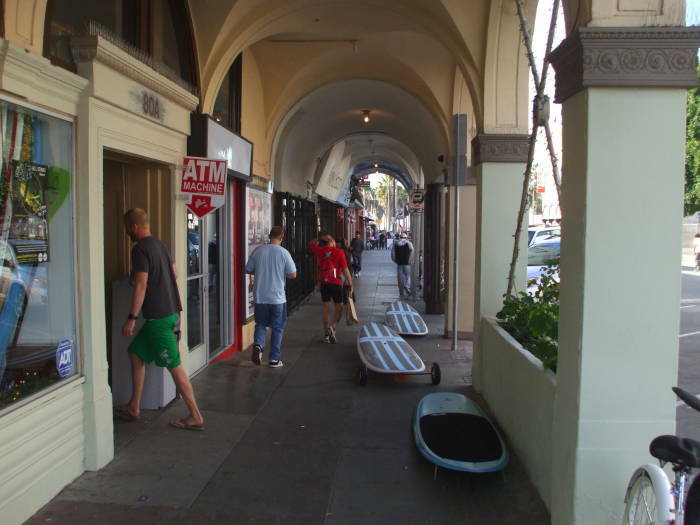 These shops are in one of the Kinney era buildings opening into the arched pedestrian passageway. Its along Windward Avenue just off its intersection with Pacific. 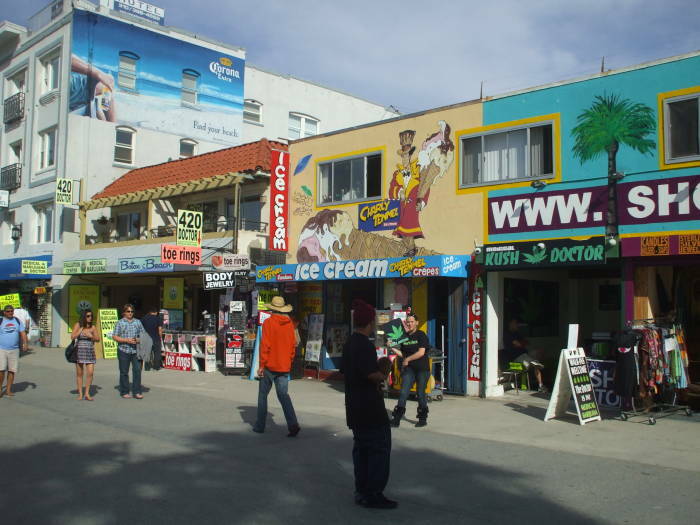 Shops along the boardwalk near Windward Avenue. These days the stereotypical Venice business is the shop selling souvenir T-shirts, sunglasses, hats, and ponchos. Some of these are in shipping containers and other non-permanent structures. Things close down early in the evening in Venice. The shops are all closed by the time it gets dark, and the local bars have last call around 10:30 to 11 PM, even on Friday and Saturday night. 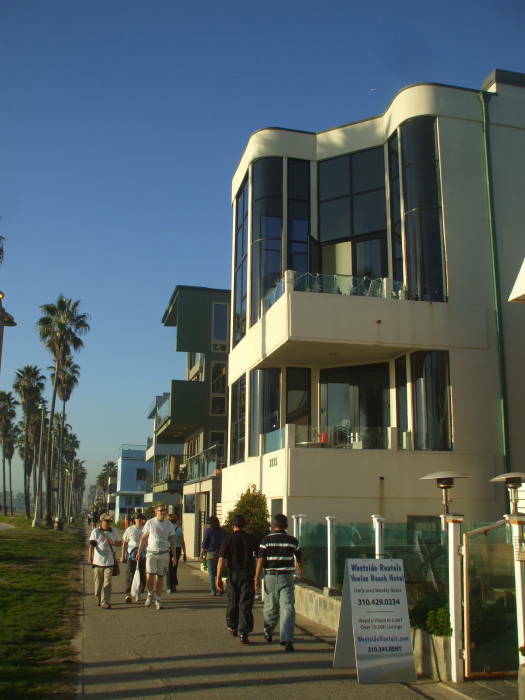 Many of the buildings along the boardwalk appear in pictures from the 1920s and 1930s. 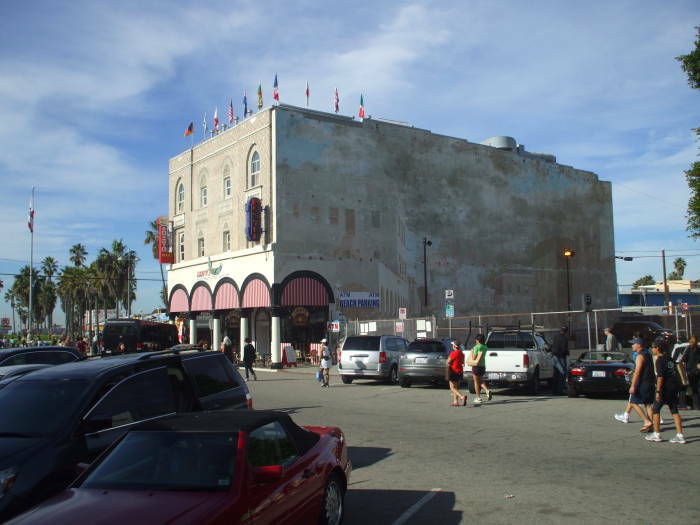 The Venice Cafe, at the end of the blue and white building seen here, has been around in some form since those days. 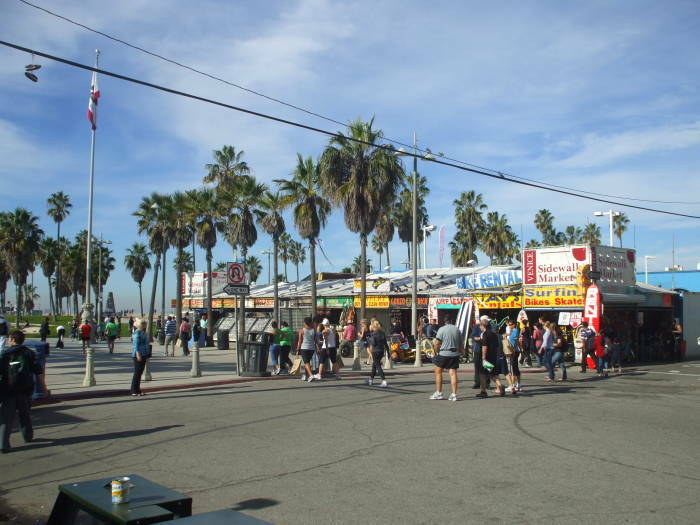 Shops along the Venice Beach boardwalk. 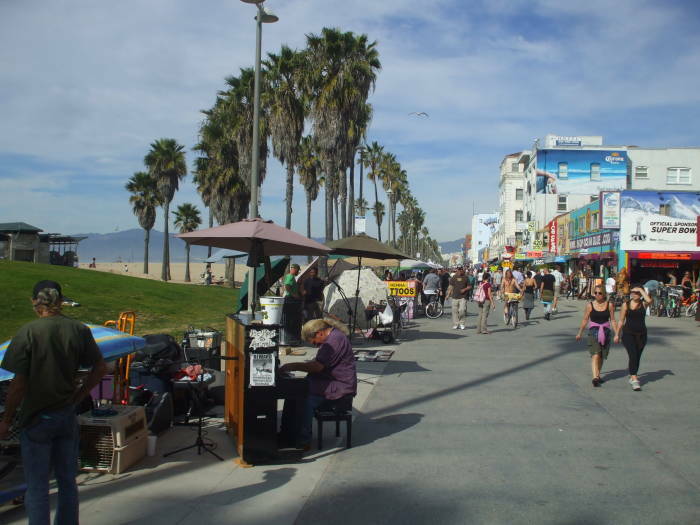 Piano player on Venice Beach boardwalk. Some of the boardwalk musical acts are more involved. This guy is playing an upright piano that they roll out onto the boardwalk every day! 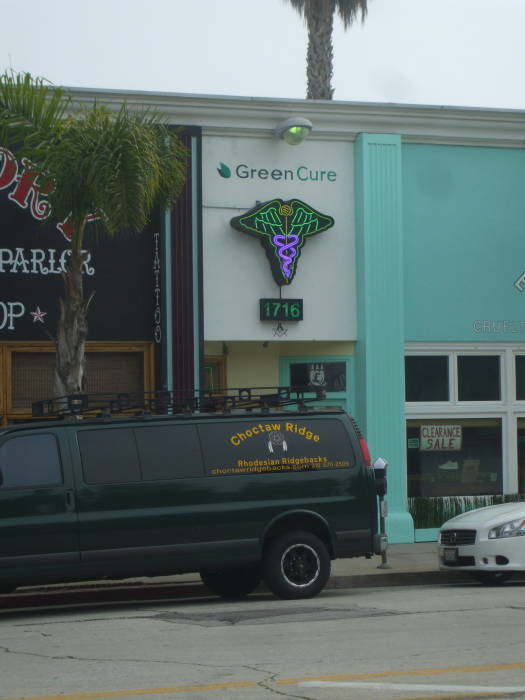 Here is an array of smaller shops: clothing, medical marijuana, ice cream, body piercing and jewelry, a botox clinic, more medical marijuana, and so on. 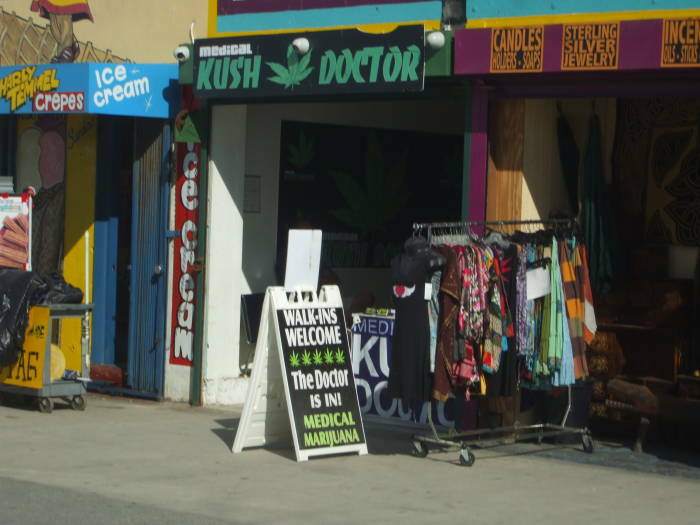 Kush Doctor medical marijuana clinic along the boardwalk. 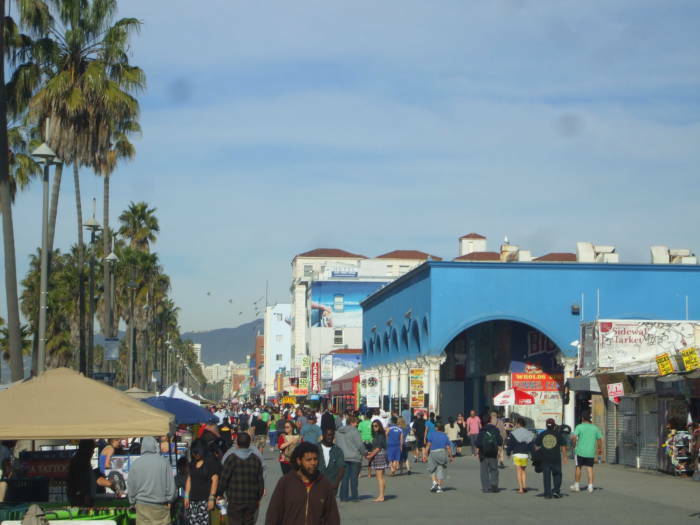 Yes, there are several medical marijuana clinics along the boardwalk. A New Yorker article from 2008 describes the booming medical marijuana industry in California. That same year an estimated 2,100 dispensaries, co-operatives, wellness clinics and taxi delivery services were taking in about $2 billion a year while generating $100 million in state taxes. Medical marijuana clinic next door to a walk-in Botox clinic. Kush is a strain of cannabis native to the Hindu Kush mountains of Afghanistan. It is the preferred high-potency variety. Or at least "Kush" is a term people prefer to use. It's not clear that one would actually get purebred Hindu Kush cannabis, as it's grown upstate in California. It's not as if this is entirely new. Cannabis was the primary pain reliever in western medicine through the 1800s until the development of the modern formulation of aspirin in 1897. Cannabis Americana U.S.P. sold by J.L. 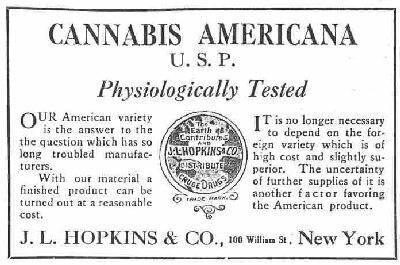 Hopkins and Company of New York before it was banned by the 1937 Marijuana Tax Act. It pretty much cures whatever ails you. Appetite loss or full-blown anorexia, arthritis, cancer, chronic pain, chronic fatigue, AIDS, glaucoma, migraine headaches, persistent muscle spasms, nausea, vomiting, sickle cell anemia, depression or anxiety, neurological and psychological disorders, gastrointestinal disorders, menstrual cramps and pain, auto-immune disorders including lupus, hepatitis C, sleep disorders and insomnia, diabetic neuropathy, and severe asthma. And if you can't manage to convince someone that you suffer from one of those, "ANY CHRONIC OR PERSISTENT MEDICAL SYMPTOM." I suspect that the only real symptom needed is the possession of $40. That gets you a prescription with which you can buy medical marijuana from a licensed dispensary. Given the competition in this field, once the clinics really get going in the late morning they have hawkers carrying placards and handing out cards out on the boardwalk. Some, maybe most, throw in a free pipe. This is despite smoking being acknowledged as a detrimental method of consumption. 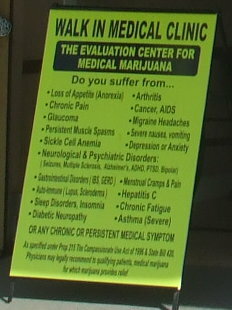 I spotted this medical marijuana clinic one block inland from Pacific Avenue, across from the bus stop. 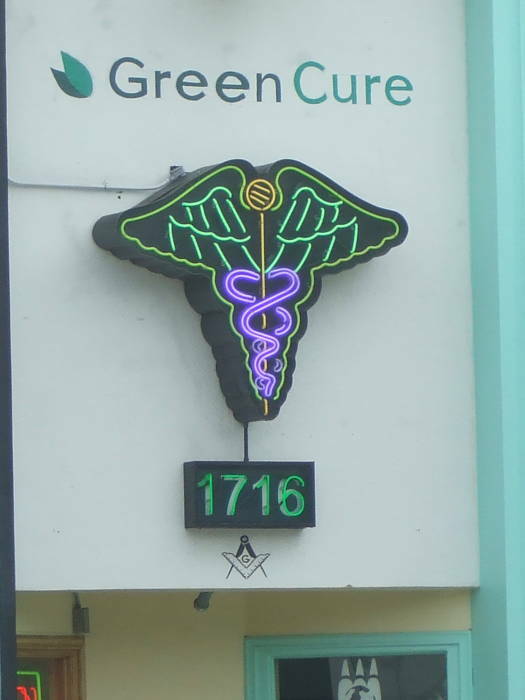 The caduceus with the neon green wings was the giveaway. A medical marijuana clinic is no big deal in that area. The surprising part was the Masonic emblem. Maybe a fellow Mason could flash the proper grips and pass-phrases and score a better deal. "Dude, I am so baked!" 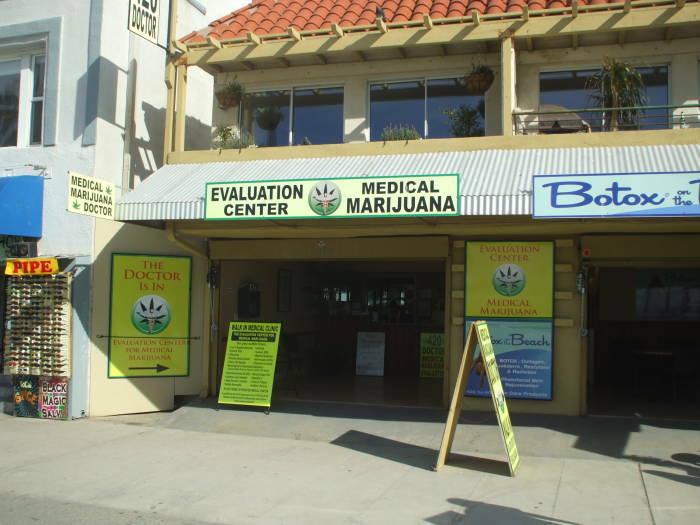 Medical marijuana clinic just off the boardwalk. Medical Masonijuana? The Great Architect Of The Universe meets the Great Weed-Dealer Of The Neighborhood. The more common iconography includes the green-winged caduceus, the word Kush (frequently in the form of "Kush Doctor"), and 420. The last of those comes from a group of teenagers at San Rafael High School in 1971, who would meet at 4:20 PM to search for an abandoned cannabis crop they had heard of. It became their term for smoking marijuana, and somehow spread to the culture at large. Silly me, I would have guessed it referred to the California state law legalizing medical marijuana use. No wait, that's also correct, it's California Senate Bill 420. That can't be a coincidence. That's more than enough on the recreational botany and pharmacology. What else happens in Venice? A lot of art! There are several prominent murals along the boardwalk, including this Rene Magritte style mural of an artist painting a mural. 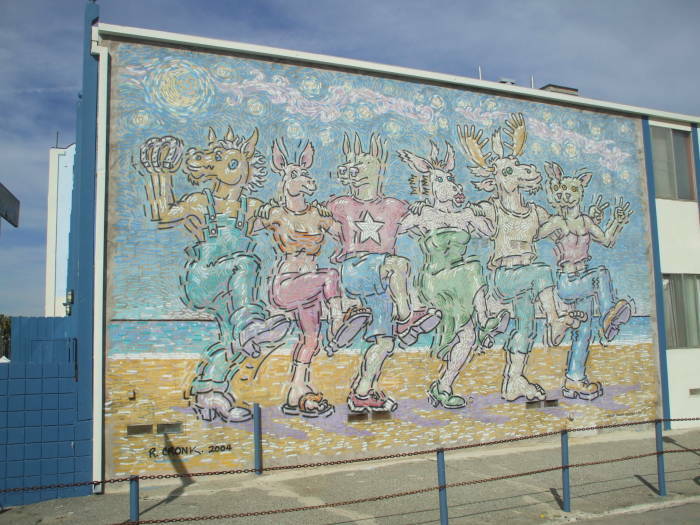 A mural along the boardwalk. Even the shadow is painted. Another mural along the boardwalk. 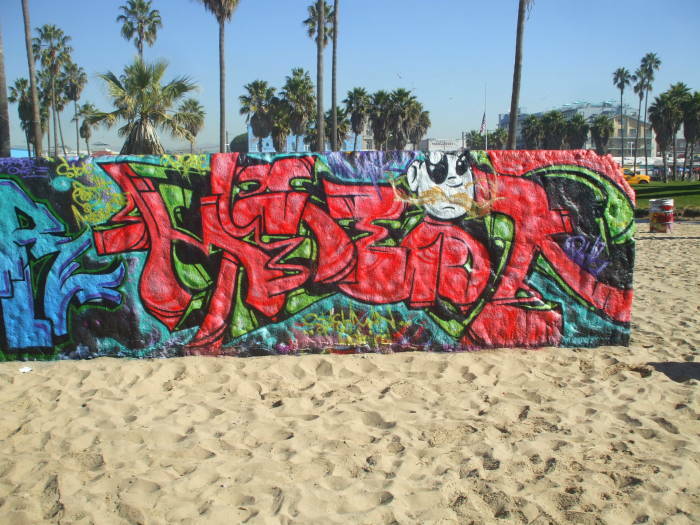 If you want to do your own graffiti-style art, you can: just get a permit first! The "graffiti walls" are straight out from the end of Windward Avenue. 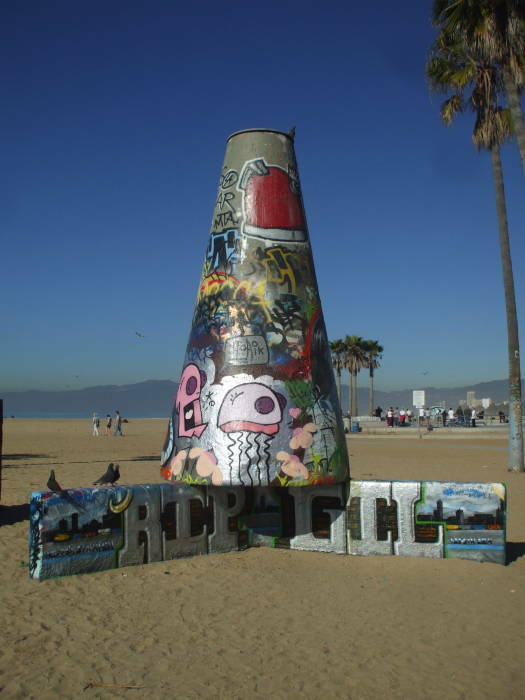 The graffiti walls include this cone on a support of three low walls, plus a pair of long walls about two meters tall. 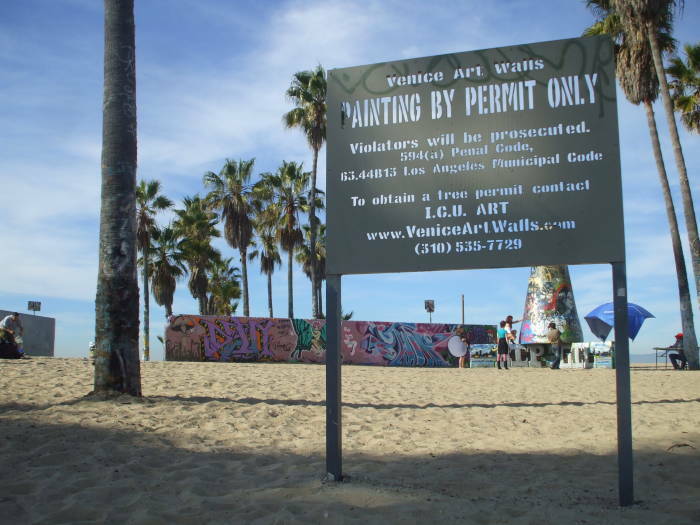 Get your graffiti painting permit. 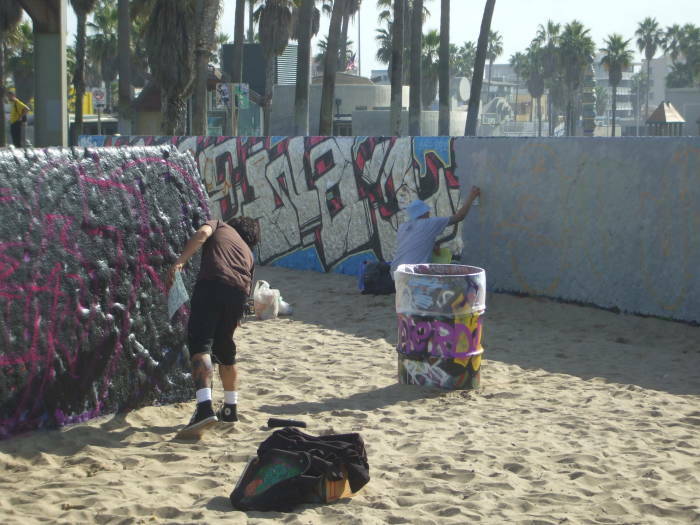 The official graffiti painting area on the beach. These two graffiti artists are just starting to paint their planned pieces. Each of them has a sketch on paper, and they're laying out the outlines on a uniform base coat. Two graffiti artists get to work. Here are the results on the following day. Even out on the beach on a breezy day you can smell the solvents. This is not an activity for indoors or close to any open flames! 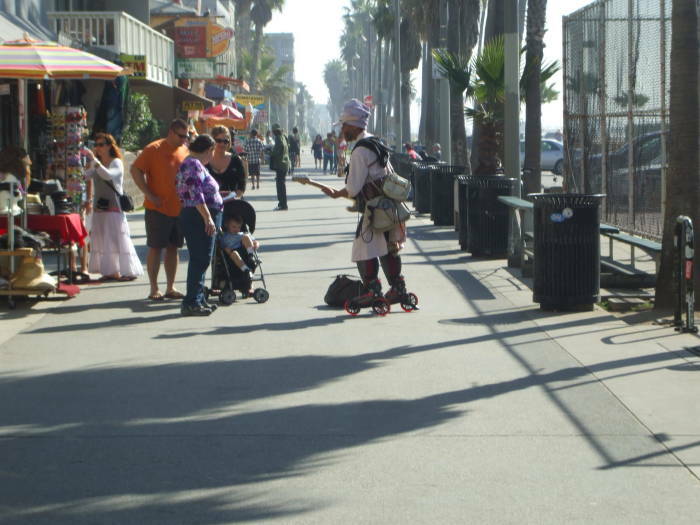 The famous local musician Harry Perry plays his electric guitar while skating along the boardwalk. He has an array of rechargeable electric batteries on his belt, along with his amplifier and speakers. Harry Perry plays his electric guitar on roller skates. He is also known by his Sikh name, Har Nar Singh Khalsa, and his musical performing name, the Kama Kosmic Krusader. His skates are Landrollers, with two large slightly inclined wheels for better stability and smoother rolling. He has released three CDs, including his Greatest Hits of the Millennium. You have likely seen him in cameo appearances in a number of movies and television shows. Is he really the father of Katy Perry? I don't think so. But a Harry Perry — Katy Perry duet would be interesting. Ride A Bike, Skate, Jog, Just Do Something! Why does California have this stereotypical image as the home of the Beautiful People? Partly it's because many of the people in California get out and exercise regularly! Bicycling is popular, and many places along the boardwalk rent bikes. The going rate is something like $7 for an hour, $15 for three hours, or $20 for all day. Bike Curious bicycle rental shop. Bicycles on the bike path along the beach. 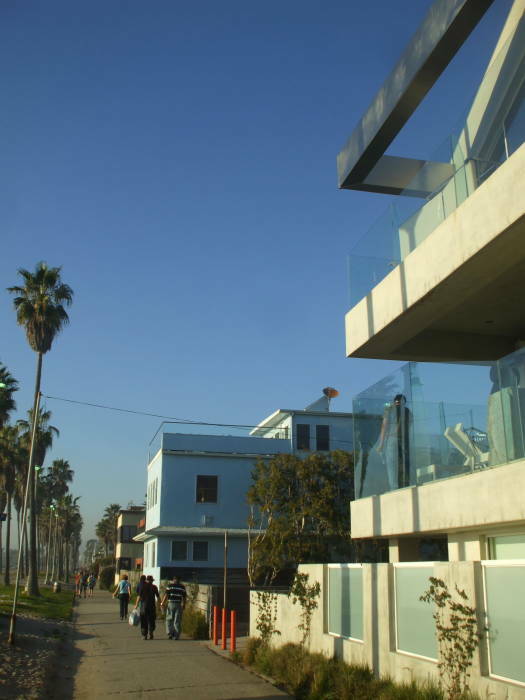 The bicycle path weaves along the upper edge of the beach, between the boardwalk and the water line. 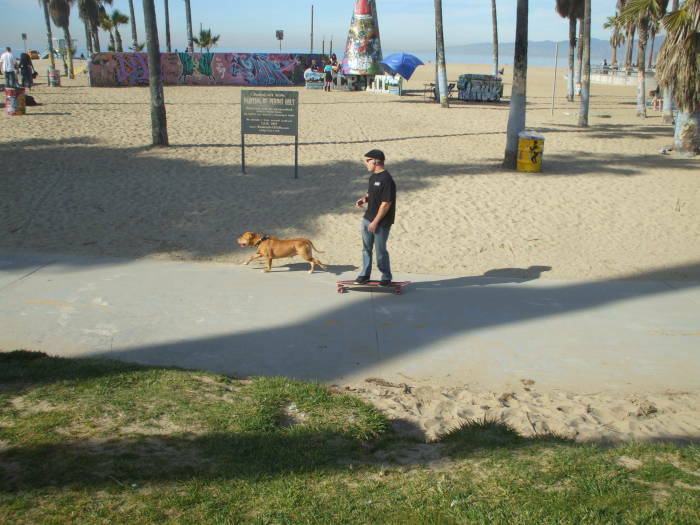 You can bike, or skate, or jog, or walk your dog. Or combine multiple activities. 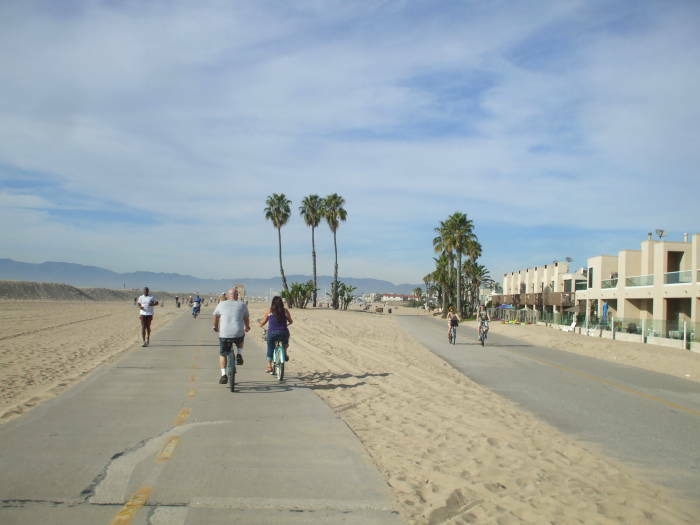 The bike path along Playa del Ray. 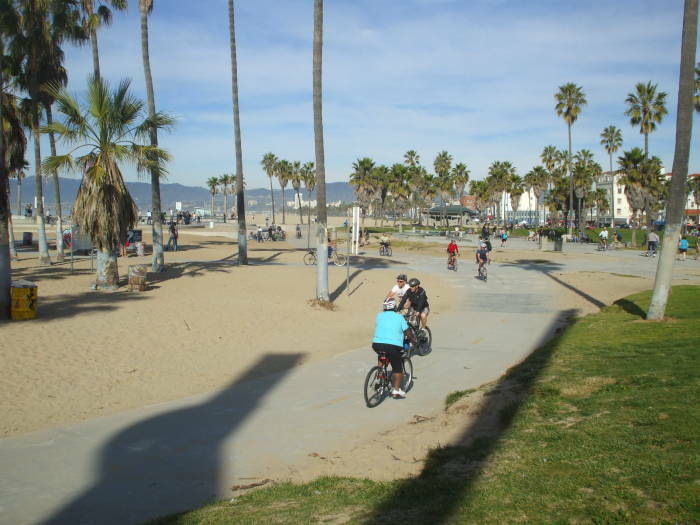 The bike path runs north through Santa Monica toward Malibu. 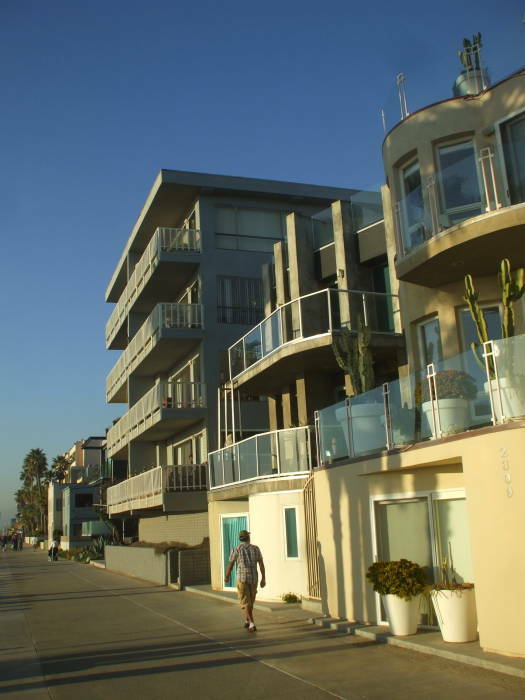 To the south, you have to loop inland around the harbor at Marina Del Rey. You cross a drainage canal on a bridge near the harbor mouth, and then it's back to an asphalt path through the beach. Above is the view returning north through Playa Del Rey after going along Dockweiler Beach as far as the Hyperion waste treatment plant south of LAX. That's about nine miles south along the path from Venice. 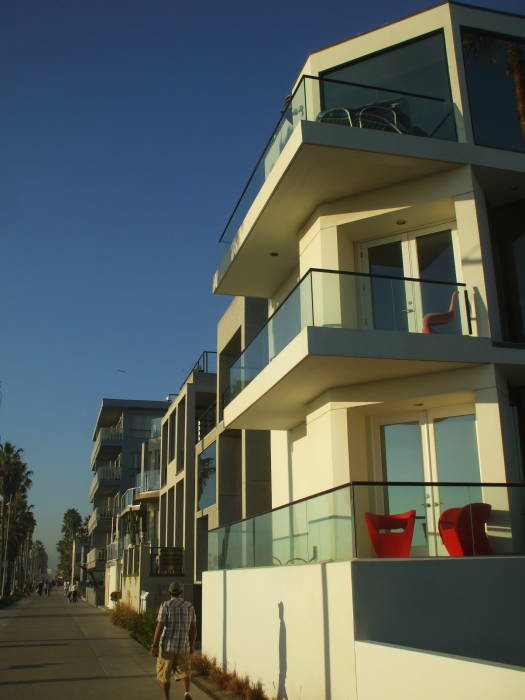 The path continues south through Manhattan Beach and Hermosa Beach. 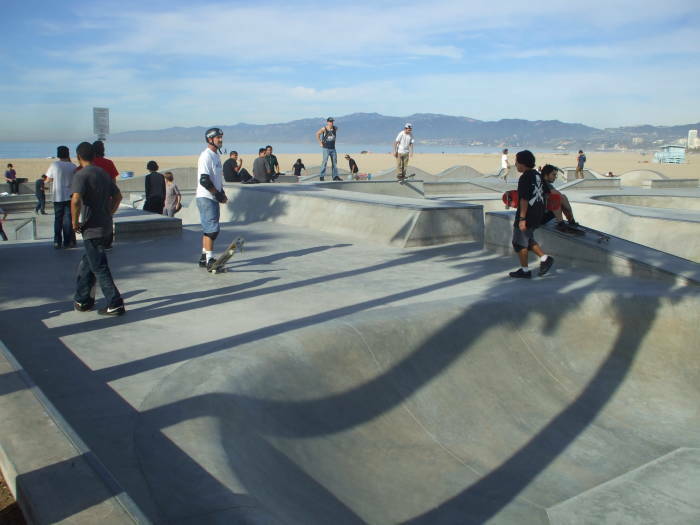 Skateboarding is huge in Venice, and this concrete skate park is a relatively new addition. 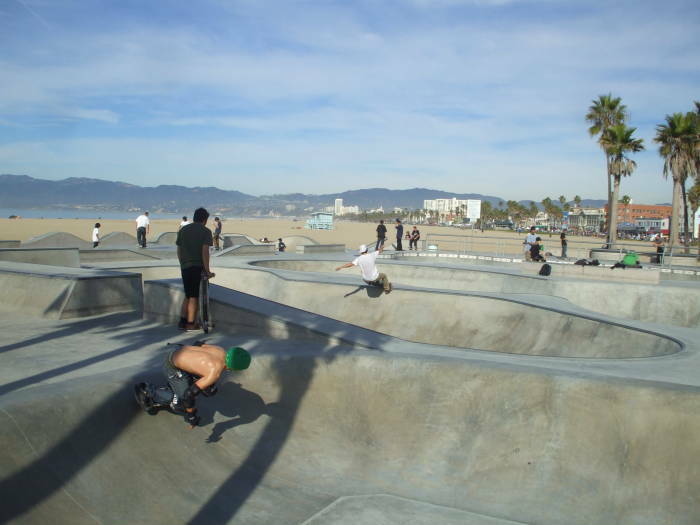 The famous "Dogtown" skating area is close by, along the border between Venice and Santa Monica. Surfer and a wave off Venice Beach. 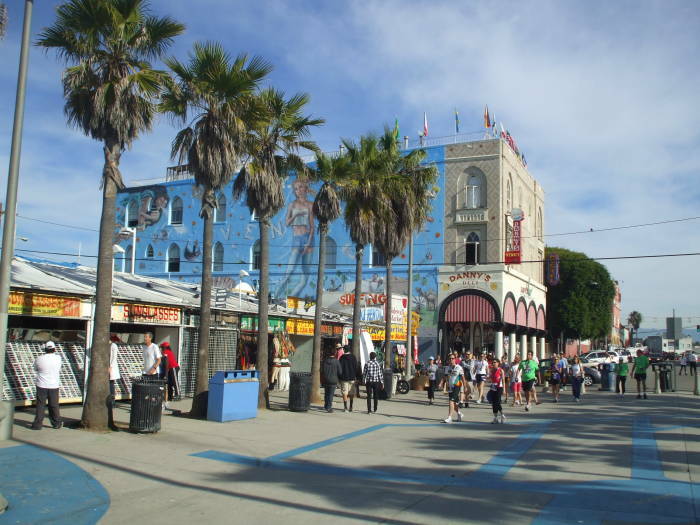 The Venice Fishing Pier is a 400 meter concrete pier toward the south end of Venice Beach, at the end of Washington Boulevard. It provides nice views of the surf. 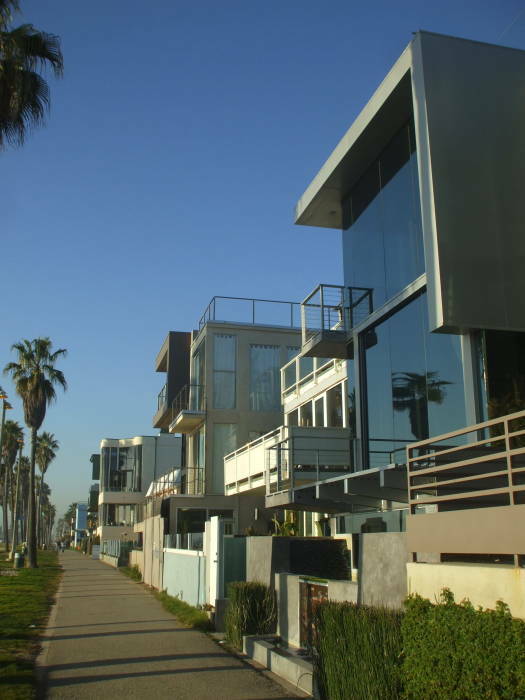 Ocean Front Walk has some very nice homes along its southern section. 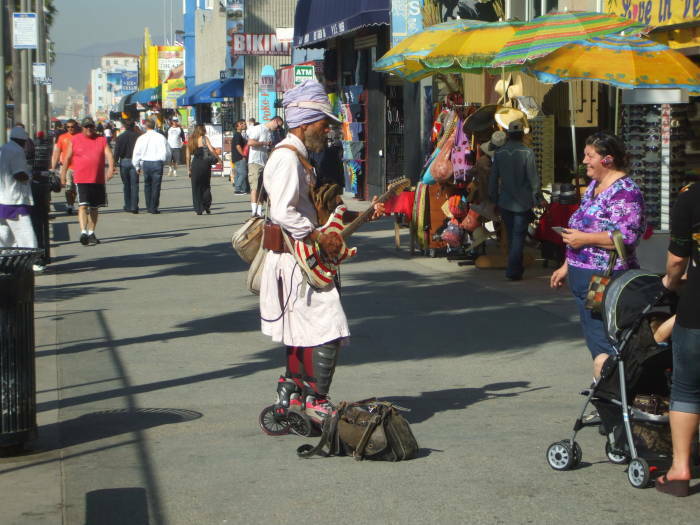 Here are pictures showing a walk from Washington Boulevard, at the Venice Fishing Pier, north toward Muscle Beach, Windward Avenue, and the shops and street performers. 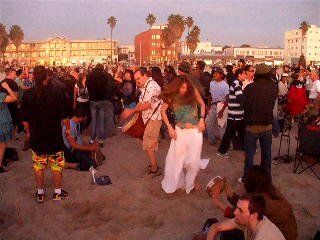 A large drum circle forms every Sunday evening on Venice Beach. It starts as the sun nears the horizon. It ends when the police break it up. Click on the images to watch the videos! Video: At the drum circle. The Venice Bistro cafe is a great place to hang out. 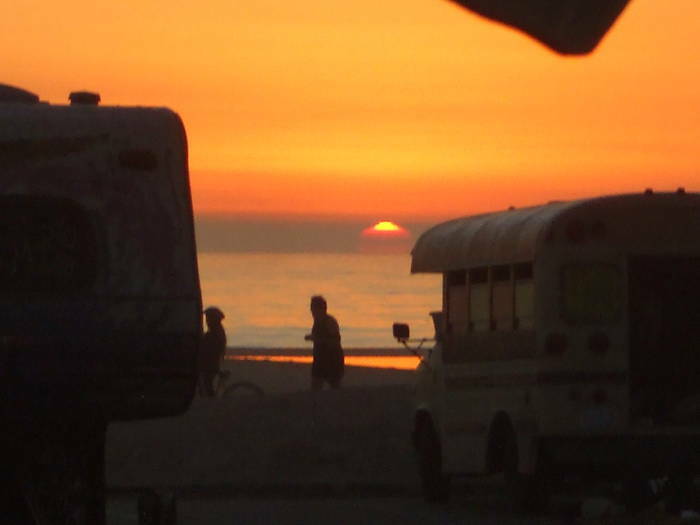 You can watch the sun set into the Pacific Ocean. 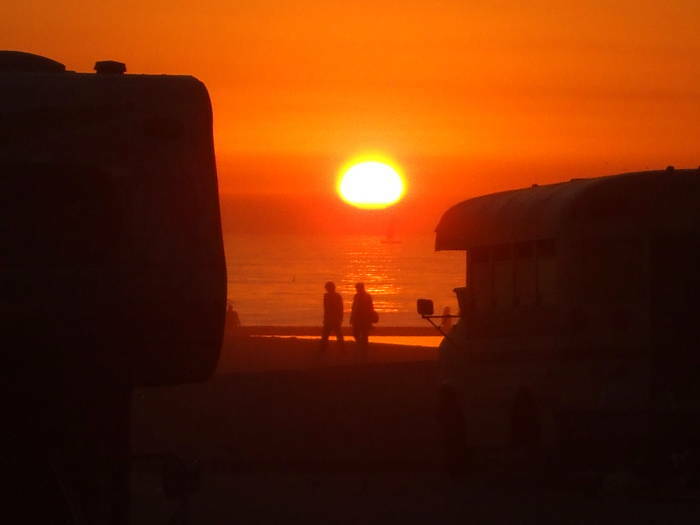 Sunset as seen from the Venice Bistro. 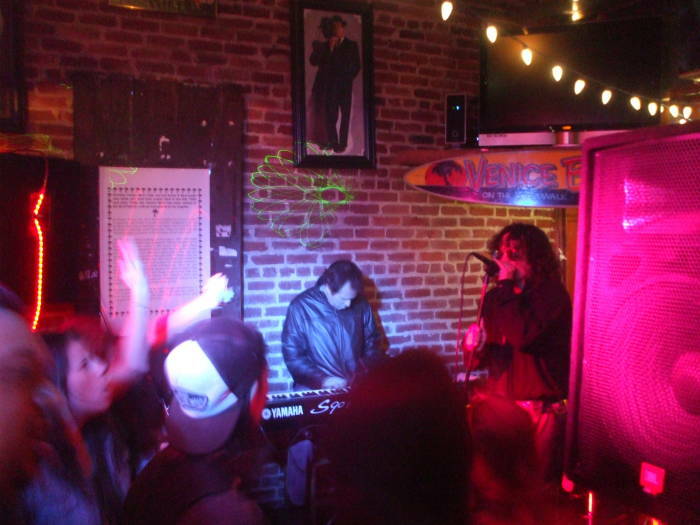 Peace Frog, a great Doors tribute band, performs every Sunday night at the Venice Bistro. Peace Frog performs at the Venice Bistro.